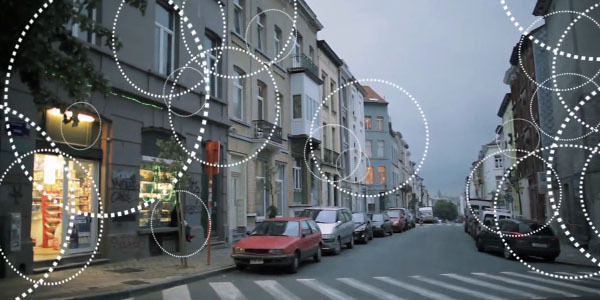 Timo Arnall, known from the mesmerizing Visualizing the Readable Volume in the Field of a RFID Reader project, made a video demonstrating a simple way of visualizing the pervasiveness of wireless technology in our physical environment. Wireless hotspots are overlaid as transparent circles into urban spaces (and, if I am not mistaken, Brussels airport). The ongoing theme in his work is to make invisible wireless technologies visible, ranging from Oyster cards to mobile phones and wireless routers in a multitude of overlapping and competing fields, in order to better understand and communicate with and about them. Using the simple abstraction of a dashed line, specific aspects that are often overlooked, such as the spatial properties of wireless technologies, can be quickly communicated. Timo has been using these images to sensitize designers and students to the spatial and embodied properties of technologies such as RFID, Bluetooth and WiFi.